Sussex slurtronicist Kemper Norton has a terrific new EP available from his splendid website. 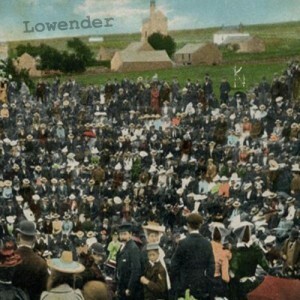 It's called Lowender, which sounds a bit suggestive (tee hee) but actually means 'happiness' in Cornish, so there. It's already gained the approval of comics writer and bon viveur Warren Ellis (who kindly plugged The OC not long ago) so you'd be best advised to run along and throw your ears around it forthwith, mmmkay? The Outer Church is taking a break in October but rest assured, we will be back. Exciting changes are afoot and there will be some big news coming up over the next couple of weeks. Meantime, enjoy the leaves! These three songs have formed a trilogy for me ever since I first heard the MBV song, which in spite of its brevity is probably my favourite piece on Loveless. The yawning arcs of processed guitar are unmistakably Shieldsian, but the track is more notable for its glorious layering of warped samples. I was very interested to find that the track wasn't credited to Kevin Shields or Bilinda Butcher, but drummer Colm Ó Cíosóig. I'm not sure what has been sampled here, but it sounds like a string section, and the warping, pitch-bending treatment, along with the looping, has the effect of making it sound like a distant echo from a halcyon age, a brighter version of the degraded romanticism essayed by James Kirby via his work as The Caretaker. Kate Bush's song, whose narrative follows the nervous deliberations of a bankrobber, seems at first an unlikely twin to the MBV piece. Yet when the astonishing dream sequence of billowing synths is introduced at 0:55 (and repeated at 2:02) you might just see what I mean. Not only is there a sonic similarity, this section of the song also shares a sense of the faraway, a retreat into fond memory, with Ó Cíosóig's piece. While the chorus of Talk Talk's 1984 single articulates a very 80s form of adolescent angst, the cloudlike synths on the verse transport the listener - or me anyway - to a similar space. It's almost a physical feeling, my consciousness moving back through time to an unspecified elsewhere. I'm not 100% certain but I think what links the Kate Bush and Talk Talk songs is the Sequential Circuits Prophet-5 polyphonic synthesizer, known for it's rich, lush textures, and also used by 80s Doctor Who composer Keff McCulloch and Roxy Music on Avalon... the title track of which could have been a fourth entry, thinking about it.